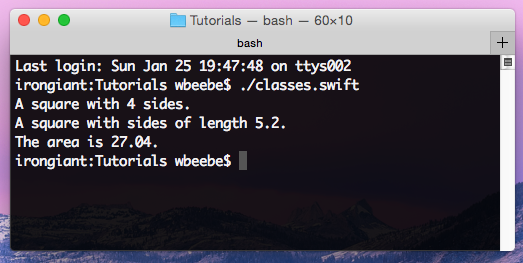 I’ve spent parts of Saturday and today going over Apple’s “The Swift Programming Language,” looking to get a toe-hold on how to use Swift. Using vi and some of the examples in the Swift book, I hacked together a few scripts that illustrate some of the features of the language. I also went out on the web to find a few features I couldn’t find reading the book. The shebang line (line 1) is standard for all scripting languages. I’ve seen more elaborate shebang lines on other postings, but this one, which is “classic” Unix/Linux, works just fine on Yosemite OS X 10.10.1. The Process class (line 5) is unique to Swift. In the output, the first argument (usually considered the zeroeth argument in other languages like C and C++) is the name of the script/program that was invoked. This will include the full path. Process.arguments can handle any arbitrary number of command line arguments. I first came across this on the practicalswift.com website, and it had a more elaborate shebang line (thus the comments above). But the site’s version was written back in June 2014, during the beta period. It’s a bit sad that nothing new has been written on the site since June 2014. This second example shows a big of class declaration and class inheritance within Swift. This is all written in the same script; I’ve yet to learn how to create separate script/compilation units to be included by a main executable function. return "A \(name) with \(numberOfSides) sides." This is modified code from pages 24 and 26 of “The Swift Programming Language.” I added NamedShape’s init() function and changed NamedSquare’s init() accordingly. I’m a firm believer in constructor initialization, no matter what. Both classes’ have public members. Not shown here, I wrote code that accessed both classes attributes. I don’t know how to make class attributes non-public. Both classes have the equivalent of constructors (the init function). When instantiated you must declare the argument type by name (see lines 17, 25, and 37). I was surprised by this at first, but whatever, it’s one of the rules, and when in Swiftville, you do what the Swifties do. Class Square shows inheritance from NamedShape (line 20) as well as over riding Square’s simpleDescription() at line 32. There are other scripts I’ve written, such as a largish one investigating the use of dictionaries (associative arrays). The syntax is clean and easy to read, allowing for some fairly sophisticated data structures. There’s a lot more I need to learn, the most important being how to easily set up file I/O. Other facts I’d like to learn about Swift is how to spawn applications, script interop communications, some possible threading, and how to link to other Swift scripts/classes. But it’s late and the Labs are staring at me for their walks. Time to sign off.